Posted by peter88 from the Food and Beverage category at 29 Apr 2017 10:26:40 am. It's been said that risotto waits for no one. And perhaps that is true if you want it fresh, but now you can turn leftover risotto into a show-stopping special meal. While you enjoy a delightful creamy risotto for dinner, the question remains; what do you do with the leftovers? As delicious as it is freshly made, it doesn't reheat well. To the rescue, arancini, those delicious Italian fried rice balls, crispy on the outside and inside creamy risotto filled with velvety melted cheese centers. Arancini originated in Sicily around the 10th century, but have become so popular today that the word "arancini" was recently added to the Merriam-Webster dictionary. Not only are arancini delicious, but they can be made large or small to serve as a main dish or an appetizer, plus they can be made ahead of time and fried right before serving. See for yourself what all the fuss is about with this arancini recipe, which is provided by the maker of RiceSelect Arborio, the number one selling Arborio in the U.S.
Heat the olive oil in a large saucepan over medium heat. Add onion and garlic; cook, stirring until onion is soft but not browned. Add rice; cook stirring for 2 minutes. Stir in ? cup stock; continue cooking and stirring until the liquid is absorbed. Continue adding stock 1/2 cup at a time, stirring & cooking until all the stock has been absorbed. Stir in prosciutto. Season with salt and pepper to taste. Remove from heat; stir in Parmesan cheese. Transfer risotto to a bowl, and allow to cool; if time allows, chill for an hour in refrigerator. Stir 1 beaten egg into risotto. In a small bowl, whisk together remaining egg and milk. Roll 2 tablespoons of risotto into a ball. Press a piece of mozzarella cheese into the center; roll to enclose. Coat lightly with flour, dip into the egg mixture; roll in Panko to coat. Refrigerate for 10 minutes (or overnight). Heat oil for frying in a deep fryer or deep saucepan to 350 degrees F. Fry rice balls in small batches until golden brown. Drain on paper towels. 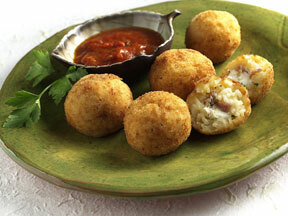 Serve with warm marinara sauce. For more information on this and other mouth-watering recipes, visit www.riceselect.com.